Highly digestible protein sources make Carnivore Care an ideal choice when providing supplementation for carnivores that are not eating due to complications. The 48% protein 33% fat formulation with added vitamins and minerals promotes weight gain and can serve as the sole source of nutrition. 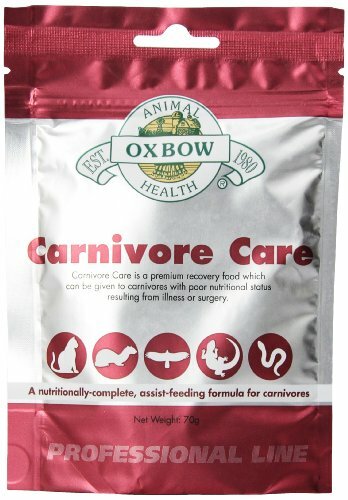 Carnivore Care is available in a convenient powdered formula, that when mixed with water, allows for the accurate feeding of just the amount needed. If you have any questions about this product by Oxbow, contact us by completing and submitting the form below. If you are looking for a specif part number, please include it with your message.